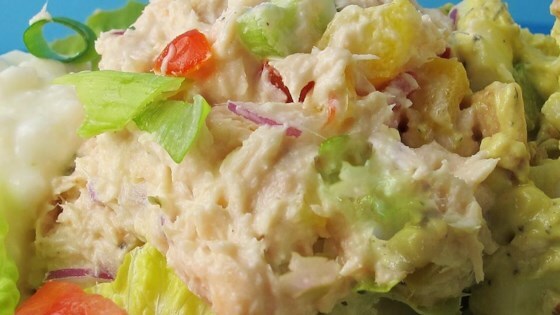 "This tuna salad is made special with the addition of cream cheese and chopped raw carrots. Red peppers make it pretty and one or two other vegetables, fruits or nuts keep it changing and interesting. I developed this recipe after I tasted cream cheese in a salmon salad sandwich at a funeral lunch in Canada many years ago. Add baby spinach or lettuce leaves, and serve on your favorite bread or as a wrap in a tortilla." Stir mayonnaise and cream cheese together in a bowl until smooth. Add tuna, carrot, and red pepper; season with pepper. I really like the touch of cream cheese with tuna. As the footnotes suggested, I made it my own. Added minced onion, sweet pickles, and almonds. Thanks Joan! I was out of tuna so I used chicken. Delicious! The cream cheese is a delightful addition. Tuna is on my shopping list so I can make this again. I used thai sweet chili tuna and veggie cream cheese. So good. everyone loved it. left out carrots, added onion. loved the crunch of the bell pepper.